Are you scare of the power problem that comes with Bitcoin mining? Is power consumption really a huge problem for crypto miners? The answer is yes. This has been one of the main concerns of crypto miners. Mining crypto can be really profitable to everyone, but let us not forget the expenses that go along with mining cryptos. It is indeed, one of the biggest hinders in crypto mining. The rising electricity consumption in crypto mining is one of the things that motivated this company to push for a better crypto mining service. A green-energy startup says it can solve bitcoin’s surging electricity consumption without boosting pollution, an issue threatening to halt the meteoric rise of the virtual currency. Austria’s HydroMiner GmbH raised $2.8 million after closing its first initial coin offering on Wednesday, according to its website. The cash will be used to install high-powered computers at hydropower plants, where the company says it can mine new digital currencies at a cheaper cost and with lower environmental impacts. The electricity needed by the global network of computers running the blockchain technology behind bitcoin has risen more than two-fifths since the beginning of October, to about 28 terawatt-hours a year, according to the Digiconomist website. That’s more power than all of Nigeria’s 186 million people consume each year. Much of the electricity feeding bitcoin projects is coming from generators fed by fossil fuels. Bitcoin’s meteoric rise is attracting a ton of attention. Is it ready for the mainstream? Even as bitcoin approaches $8,000, the price required for mining to be marginally profitable may reach a jaw-dropping $300,000 to $1.5 million by 2022, according to Christopher Chapman, an analyst at Citigroup Inc. He based his estimate on current growth rates for mining and the electricity consumed by computers doing the work. 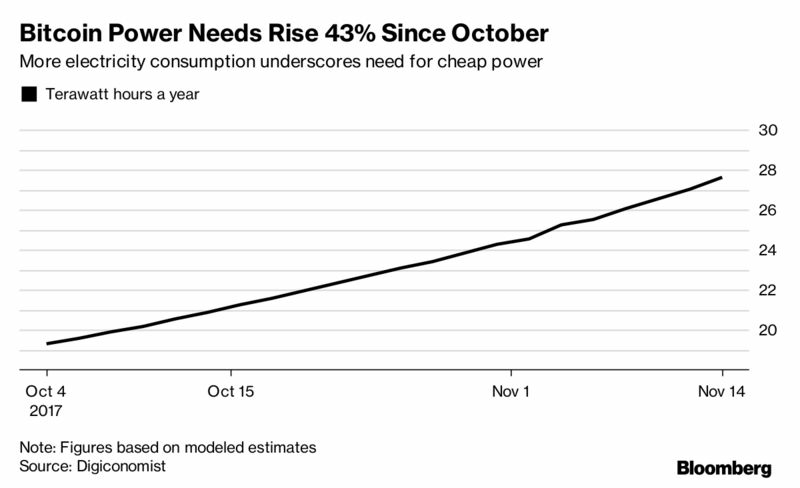 At that pace, the power consumption implied by bitcoin’s growth may eventually match what Japan uses. Enter HydroMiner, a six-person startup that’s already running cryptocurrency servers at two disused Austrian hydropower mills. It’s outfitting modular shipping containers with servers and software that can be placed at power stations. Instead of air conditioning, they circulate cold Alpine currents through piping to keep their equipment cool. HydroMiner’s business is designed to take advantage of Austria’s plentiful hydropower reserves. The country has more than 2,000 small stations, many of them sitting idle because of low wholesale power prices and an absence of state support. 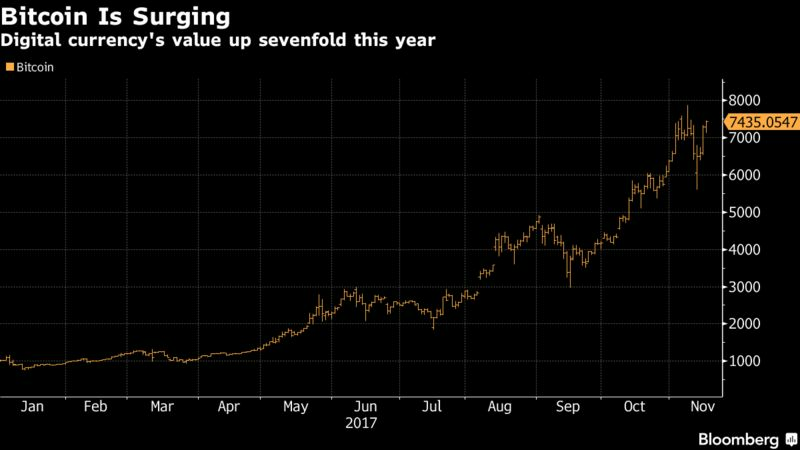 The company pays mill owners the equivalent of about 4.5 cents a kilowatt-hour, far below the 19.3 cent break-even pointneeded to make a profit from minting bitcoins. “We’re using renewables not only to be environmentally friendly but also profitable,” according to Dablon. 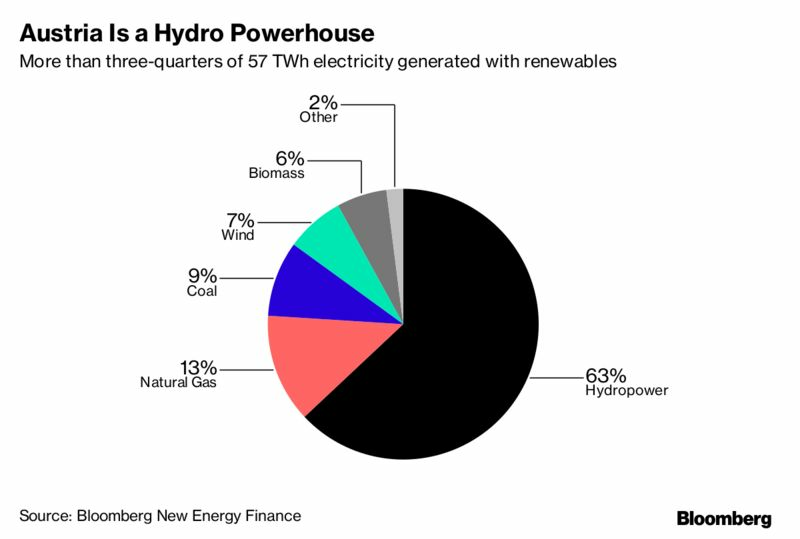 Austria’s utilities have also started taking notice of the new revenue streams that could be generated by the country’s hydropower resources.